Forget about the war on terror, here are the $5.29 War on Error Army Men Erasers who intend to make sure that no mistakes or errors will ever live to see the light of day, and it is the ideal troop to get rid of them pesky Grammar Nazis, too. 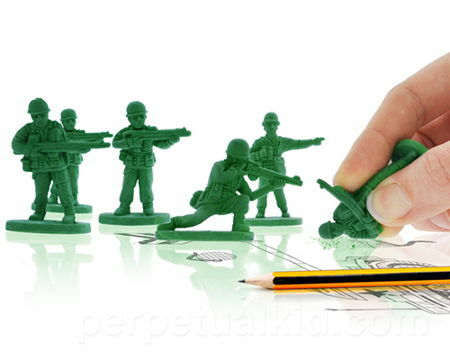 It is definitely an interesting take on the normal plastic green army men, as these are all made out of rubber so that they can be the best at what they are at – eliminating errors and mistakes from the face of a paper. Grievous grammatical errors and pesky punctuation problems will not stand a chance against these, but if you are using a permanent marker on that piece of paper, then it is a problem that only a nuclear bomb equivalent can solve. Each purchase would arrive with half a dozen GIs, and they’re just too precious to use in my opinion.